Compose the invite before you write out the final copy to avoid mistakes. Particular events and celebrations might require writing formal invitation letters to each guest. But doing so can be difficult in an age where letter writing has fallen to the wayside in lieu of technology, emails, cell phones and other forms of fast communication. Almost any event that could be considered "black tie" can merit a formal invitation. Even a teenage boy looking for a creative way to ask a girl to prom can use a formal invitation to get her attention. Two types of structures can be used when it comes to writing formal invitation letters. The first structure is the most commonly used, and looks similar to most formal wedding invitations. Every line is centered, with script lettering and proper prose. This type of formal invitation is perfect for almost any hosted party or event. The second is structured similar to the block-style professional letter often used in business correspondence. This type often is sent when a more detailed explanation of the party or event is needed, as it allows more room for details. It is generally used in work situations for corporate fairs, conferences or meetings and not for galas, holiday parties or celebrations. For formal celebrations, it is important to understand what is required for the invitation. Before putting pen to paper, know exactly how the invite should appear. Use invitation paper that is white or ivory in a heavy stock, sized to approximately five by seven inches. One-inch margins should be left around the centered writing. Text should be in black ink, either handwritten calligraphy or a computer-printed script that is easy to read. Envelopes should be lettered in the same font or handwriting to keep the look consistent. Dates and times should be spelled out instead of using numbers. For example, "Friday, March 15th at 9:00 p.m." should be written, "Friday, the fifteenth of March, at nine o'clock in the evening." Any enclosure listings and additional information should not be centered, but instead, written in the bottom corners. A fundraising charity ball might need to list "Black tie" in the lower right hand corner and "R.S.V.P. card enclosed" in the lower left. Some etiquette guides call for all additional information to be listed together in the lower right hand corner, which is also acceptable. It can be hard to compose a formal invitation without seeing another written. It is possible to find help from software like WriteExpress, but often, just a few examples can help clear up any confusion about writing a formal invitation letter. LoveToKnow has created several templates that can be used by readers for their formal invitation needs. Writing letters seems to be a thing of the past as the twenty-first century pushes forward. Rise to the occasion by composing an invitation letter to your next formal event. 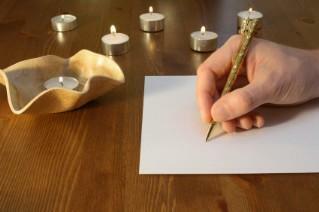 Reply to any formal invitations received by sending a handwritten acceptance or regret letter.